Did you know that the true Jesus of history had no intention of founding a new religion and that the faith that took His name actually arose long after His death Did you know that our Lord did not portray Himself, nor did His first followers see Him, as the Messiah, but rather as an enlightened teacher, amazing physician, and sagacious prophet Did you know that the real Jesus never referred to Himself as "Savior" or even as the "son of God," but instead called Himself the "son of Man," a common Aramaic expression meaning a "human being" Did you know that He did not preach "The Gospel of Jesus Christ," but rather what He called "The Gospel of the Kingdom," which concerns a spiritual state of mind Did you know that like His brother James (the earliest New Testament writer) the genuine Jesus never mentioned His virgin birth, His Disciples, the Twelve Apostles, the Last Supper, His coming betrayal, trial, redemptive death on the cross, or resurrection, or even the Christian faith And did you know that the evidence for all of this can be found in a secret scroll known as "The Gospel of Q" that exists in plain sight in the Bible, and yet is generations older than the four canonical Gospels In his powerful new book "Jesus and the Gospel of Q: Christ's Pre-Christian Teachings As Recorded in the New Testament," award-winning historian and Bible scholar Lochlainn Seabrook unveils the hidden enigmas of the mysterious gospel that has been "lost" for nearly 2,000 years, the little book that finally uncovers the authentic Jesus and His true ministry: The Gospel of Q. Unlike so many scholarly titles on Q, Mr. Seabrook makes this complex three-layered collection of Jesus' sayings easily accessible to everyday Christians by citing Q verbatim from the King James Version of the Bible. Also included is a helpful and easy-to-understand Introduction, a comprehensive Index, and an in-depth Bibliography that provides additional source material for the interested Q student. 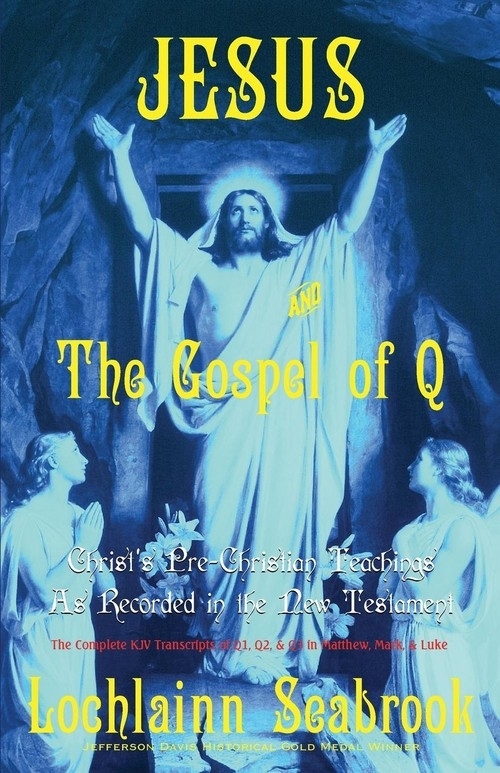 And not only does the book contain the complete transcripts of the original but forgotten Good News of Q as found in Matthew, Mark, and Luke (John did not use Q), but with nearly 1,000 endnotes and hundreds of scriptural references, academics, theologians, clerics, churches, and Christian schools will also consider this book to be an indispensable addition to their libraries. Read "Jesus and the Gospel of Q" and find out why, as the author maintains, Q is Christianity's most authoritative and invaluable document. Lochlainn Seabrook is the recipient of the prestigious Jefferson Davis Historical Gold Medal, and is the author of forty popular books for all ages, including the self-help blockbuster, "Jesus and the Law of Attraction: The Bible-Based Guide to Creating Perfect Health, Wealth, and Happiness Following Christ's Simple Formula."